Three months after giving birth to my first child, I began my 200-hour vinyasa teacher training. I did it to pursue a dream, and to remember that I could be a mom and still be me. 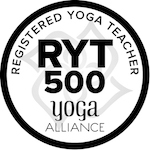 I completed additional trainings in yin, kids, and hot yoga. While pregnant with my third child, I finished my advanced 300-hour teacher training. My teaching style focuses on creativity, feel-good poses, and self-connection. The body is the site of all experience, and yoga is a tool to reflect on what is happening in our lives and in our bodies. I want your practice to give you the opportunity to remember you are a whole person - body, mind, and spirit. To find space and stability in your body. To clear your mind. To recognize your feelings and sit with your emotions. When we are connected, we are powerful. As a mom of young kids, I personally know how hard it can be to get to a studio. I offer private lessons and I'm also creating videos to help support your home practice. I hope this becomes a community in which you feel motivated, encouraged, and free to be you.